“Ain’t no Love in the Heart of the City” this venue has become a mystical location for me. 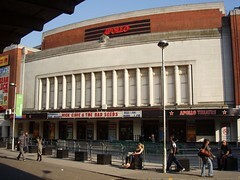 In 2003 I was lucky enough to attend AC/DC’s concert at the then called Hammersmith Apollo. This show proved that the Odeon is a special place. The next time, I want to have a photo pass and shoot a band like Airbourne, Iron Maiden or Motörhead from the photo pit. In the summer of 1983 I turned on my tape recorder to record U2s concert at the German tv show Rockpalast. At the same time I watched the live broadcast on TV. Up to then I had never heard of this band before. After the show I was totally hooked! It was just unbelievable how Bono marched with a white flag right through the audience to continue singing from the back of the venue admist the audience. Those pictures were epic. If you want to find out what Rock’n Roll is all about check out this this video of AC/DC’s show in Buenos Aires, December 2009. 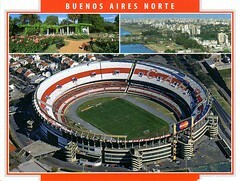 This crowd at the River Plate Stadium cannot be topped!!! I have never seen somthing that impressive alike. The entire stadium went nuts for 2 hours: from the first to the last row. This has been unrivalled yet! Check out U2′s DVD “Live At Red Rocks – Under A Blood Red Sky” and you will immediately realize the natural beauty of the natural amphitheatre which is located in the Rocky Mountains of Colorad. No doubt, it must be special to attend a show there and capture it with a camera. The natural location is just breathtaking. A perfect setting for the most spectacular open air concerts! 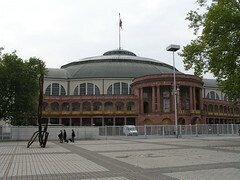 The Festhalle Frankfurt is my “home turf” just 25 minutes away from my home. I’ve been to many concerts at this fantastic hall which was build on demand of the German emperor more than 100 years ago. 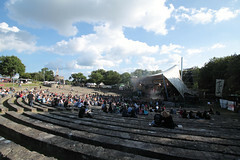 The sound is not always of the best quality but the crowd is in great shape and the artists enjoy the historic atmosphere.